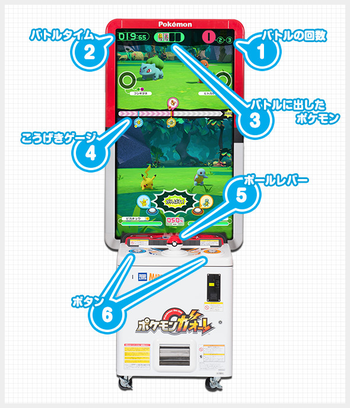 "Pokémon Ga-Olé" is a kids' amusement game machine that premiered in the summer of 2016 and tied in with the 19th Pocket Monsters movie premiere. Pokémon battles take place on a huge 50 inch monitor mounted vertically, giving the battles enormous intensity and presence! Each play costs 100 yen. "Pokémon Ga-Olé" is a game where you enjoy 2-vs-2 Pokémon battles while cheering on your on-hand Pokémon by pressing buttons according to onscreen prompts! By winning battles, you increase your on-hand Pokémon's "roar", which lets you continue battling against the Pokémon that heard the roar and appeared before you! The louder your "roar", the greater the chance of powerful Pokémon appearing, like legendary Pokémon such as "Zygarde Perfect Forme"! If you brilliantly manage to catch the opposing Pokémon after a white-hot battle that makes your hands sweat, your own Pokémon's victory "roar" will increase, and a strong Pokémon will appear! Insert a new coin and continue battling! Ga-Olé Disks are a plastic tile that players use to interact with the game. Each disk lists the information on the specific Pokémon on a label on the front of the disk. Players can get a disk when they capture a Pokémon in-game, through promotions or included with merchandise. ① Grade (グレード) - The number of stars represents the grade. The higher the number, the higher the grade of the disc! ② Ball's Type (ボールのしゅるい) - The ball used to get the Pokémon is printed on the disks label. ④ Disk ID - The ID of the disk is listed. Ga-Olé disks with the same Disk ID can not be used during play. ⑤ Parameters (パラメータ) - HP, Attack, Defense, Special Attack, Special Defense and Speed are listed. The higher the number, the higher the power! ⑥ Z-Move (Zワザ) - The name of the Z-Move that can be used when activated! ⑦ Poké-ene (ポケエネ) - Is a number expressing the strength of the Pokémon! The bigger the number, the stronger the Pokémon! ⑧ Species Type (ほんたいタイプ) - The Pokémon's type. There are also Pokémon with two types! ⑨ Move Type / Move (わざタイプ・わざ) - The type of the move and the moves name are listed. Ga-Olé Disks also have special symbols called Icon Marks (アイコン・マーク) that indicate special abilities that the Pokémon has. Legend Icon (でんせつアイコン) - Lists if the Pokémon is a Legend. Mythical Icon (まぼろしアイコン) - Lists if the Pokémon is Mythical. Super Strong Icon (ゲキつよアイコン) - Lists if the Pokémon is Super Strong . Mega Evolved Icon (メガシンカマーク) - Lists if the Pokémon is Mega Evolved. 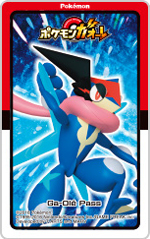 Z-Crystal (Zクリスタル) - Shows a picture of the Z-Crystal that represents the type of Z-Move. Z-Symbol (Zシンボル) - Shows the Z-Move that the Pokémon can use. Each Ga-Olé Disk has a specific species type for the Pokémon and is indicated with a icon on the disks label. Some Pokémon can have two types. The main battle mode splits the screen in two with the battle gauge bar as the main division line between the two displays. 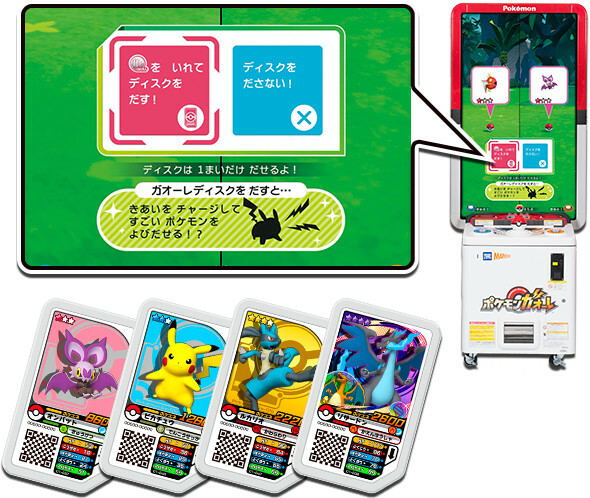 The players Pokémon which are chosen by selecting Pokémon Ga-Olé disks and placing them on the play deck are shown on the bottom half of the screen while the players opposing Pokémon are shown on the top screen during battles. ① Battle Round Number (バトルの回数) - Shows the current battle round. ② Battle Time (バトルタイム) - Shows the amount of time time left for the battle! ③ Pokémon in the Battle - Shows the Pokémon Ga-Olé disks in the current battle! 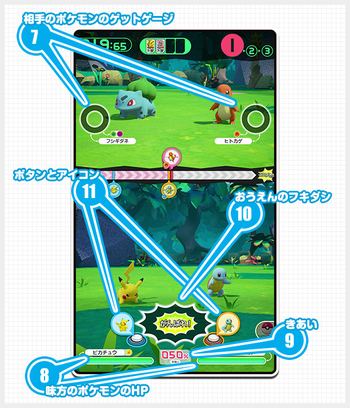 ④ Attack Gauge (こうげきゲージ) - Pokémon are placed on the attack gauge and their markers will move to the right until they are able to attack. ⑤ Ball Lever (ボールレバー) - It is used for Chance to preempt, Support Attack opportunities, ect. ⑥ Buttons (ボタン) - The buttons are used for Pokémon Cheering, Attack and Defense Roulettes, Raises Fighting Spirit, Mega Evolution, etc! 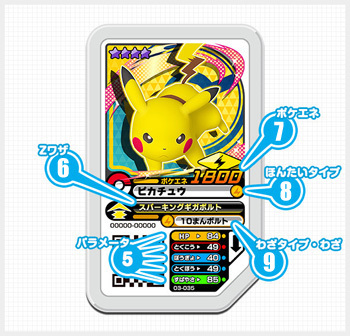 ⑦ Opponent Pokémon's Get Gauge - When a player hits an opposing Pokémon, the Get Gauge will go up. When the Get Gauge becomes full, the Get Chance will activate and that Pokémon can no longer battle. ⑧ Pokémon HP - When the Pokémon's HP reach zero, that Pokémon can no longer battle. ⑨ Fighting Spirit (きあい) - Players can press the buttons to raise the Fighting Spirit which can in-turn increase the power of attacks. ⑩ Cheer Dialog (おうえんのフキダシ) - When the Cheer dialog appears, players can press the buttons to move the location of the Pokémon on the Attack Gauge closer to right side in order to attack. ⑪ Button and Icon (ボタンとアイコン) - On-screen indicator tells players when to use the buttons on the arcade cabinets play deck. 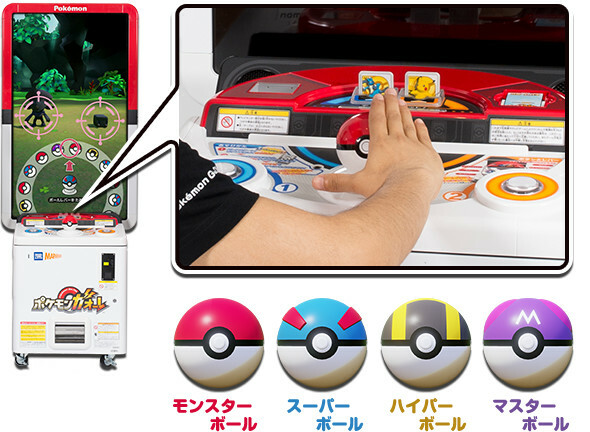 A new and easier way to battle was introduced in Dash Set 1 called the Dash System. Choose, Tap Rapidly, Attack! (「えらんで、れんだして、こうげき！). The Dash System allows a Pokémon to progress a lot faster and farther on the Attack Gauge. If a player battles twice and does not get a Pokémon, the Senior Trainer will give the player a disk. A Grade 1 to 5 disk will randomly be presented. A new Ga-Olé Pass power added in Dash Set 1 is the "Get Combo"! When you use Pokémon that complete a get combo in battle, you'll activate the combo bonus, which gives your attack gauge an advantage over the opponent's! Complete the get combo by collecting the Pokémon's pre- and post-evolution/grade-up disks! The more you have, the stronger the combo bonus will be, so obtain lots of disks, then challenge the super strong Pokémon! When the player manages to max out the opponent's Pokémon's Get Gauge or the battle time ends or the player has no more Pokémon remaining that can battle, they can attempt to get the Pokémon during the Get Time round. If the player catches the Pokémon, they can get a Ga-Olé Disk of that Pokémon. A Monster Ball Roulette wheel will appear on screen during the Get Time round. Players move the Ball Lever whenever they feel like selecting one of the Monster Balls. The roulette wheel will cycle between: a Monster Ball, a Super Ball, a Hyper Ball and a Master Ball. The type of ball that is obtained can greatly help the players chance in getting a Pokémon. 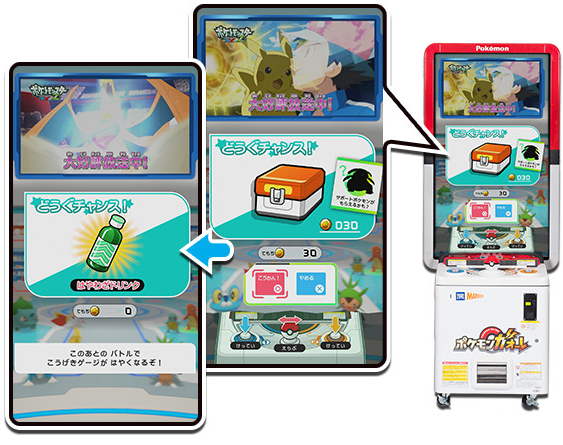 When Pokémon are successfully caught, players can insert 100 yen and select 1 of the Pokémon to be dispensed as a Ga-Olé Disk. Players can also choose not to get a disk dispensed. Before a disk is dispensed, players can increase the Fighting Spirit of the captured Pokémon which will help raise the chance that a high level Pokémon disk will come out. 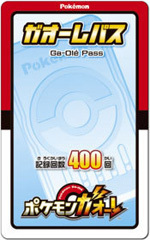 A Ga-Olé Pass is an IC card that records a players gameplay data and player information. The retail pass costs 500 yen plus tax and can be recorded to 400 times. They are sold at most major retailers or can be ordered from Takara Tomy's Mall website. 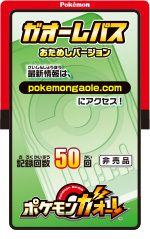 A 50 record Trial Version card is also distributed through promotions. The pass allows players to use Support Pokémon, record battle high scores, keep track of earned Ga-Olé Medals and access the Ga-Olé Members website. 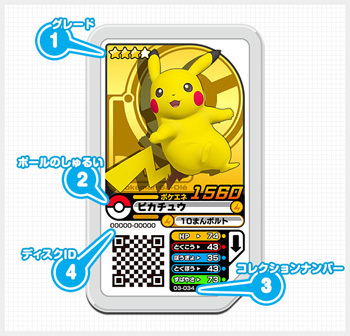 Players can scan a card by placing it on the Ga-Olé Pass Reader (ガオーレパスおきば) on the right side of arcade cabinets play deck. Players that are using their Ga-Olé Pass to record their process can use earned Ga-Olé Medals to purchase Items or Support Pokémon to use in battle. Before the start of battle, players can spend 30 Medals to purchase one of the Items. こうげきカプセル Raises attack and special attack. ぼうぎょカプセル Raises defense and special defense. はやわざドリンク Increases the speed that the Attack Gauge moves. ねらいスコープ Attacks have a higher chance to hit. サポートポケモン A Pokémon that can support the player in battle. This page has been viewed 13284 times.